With backsides glued to couches and tailgates taking place every weekend, there is no doubt that football season is back in full swing. But heading into the 2015 NFL preseason, the Arizona Cardinals’ sideline looked different than it had ever before. 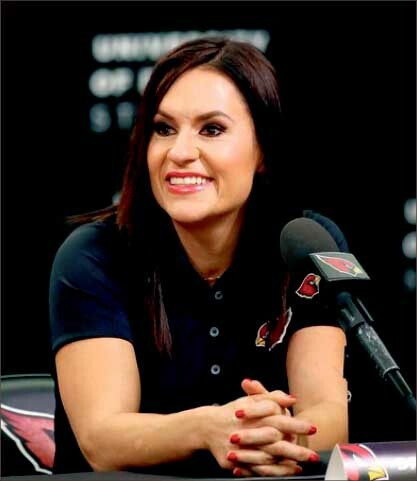 The big and burly men of the Cardinals linebacking crew were joined by 37-year-old Jen Welter. And no, Welter was not a cheerleader. According to the Washington Post, Welter, who holds a Ph.D. in psychology, was hired as a preseason intern. Through the internship, she was given the opportunity to help coach the linebackers of the Cardinals. In 2014 Welter coached the linebackers for the Texas Revolution, a men’s professional indoor team, in addition to playing running back for the team. Though Welter’s internship with the Cardinals has ended, she said her time with the team was an overwhelmingly rewarding experience. As Welter made a resounding splash into the proverbial pool of men’s professional sports, it is necessary to reconsider our preconceived notion that women have no place in typically male sports. Maybe women have more to offer to professional sports than previously thought. Welter is not the only woman making her way into the “men’s world” of professional sports. In 2014, Becky Hammon became the first female full-time assistant in the NBA while working for the San Antonio Spurs. Hammon is no novice when it comes to the game of basketball. She was a six-time WNBA All-Star and a two-time All-WNBA First Tea selection. In addition, according to USA Today, Hammon became the first female head coach of an NBA Summer League team, where she guided the Spurs to the Utah Summer League title this past summer. Hammon is well respected by her team and the league for her contributions to the Spurs organization. “When (Hammon’s) talking, (the team is) looking at her,” Bobby Marks, a former Nets assistant general manager who attended the Las Vegas summer league, said in the Washington Post. After Hammon began to pave the way for women in the NBA coaching community, the Sacramento Kings hired Nancy Lieberman as an assistant. Lieberman has also compiled the knowledge and skills to be an asset to a professional team. According to nba.com, she was previously the head coach of the Dallas Mavericks’ D-League team, which she led to the playoffs in its first season. She also was previously the head coach and general manager of the Detroit Shock in the WNBA. Women who are physically and mentally qualified may also bring a different psychological aspect to the professional sports world. Scientifically, it has been proven that women and men think and act differently. Women who may approach a problem or situation differently than men would bring a fresh perspective to the coaching world of professional sports. According to psychologytoday.com, women can juggle more than one task 70 percent better than men. Multitasking is essential in coaching, as coaches need to keep track of many different things at one time, especially on game day. Studies have also shown that women who are in conflict tend to respond to their frustration by working harder. Coaching a professional game against an opposing team is a conflict, and coaches who can channel their energy into working harder are necessary for success. Psychologytoday.com also says women express their emotions differently. Women are more upfront and share their emotions while men tend to hide their emotions. Coaches who are in touch with their emotions can benefit the players. According to CNN, Welter left handwritten notes in the lockers of the linebackers before the preseason games. “They loved it,” Welter said to CNN. “And I found that out because they shared it with the media. I didn’t share it. I wouldn’t have because that was personal; that was from me to them. Women are also breaking into the professional refereeing world. In 2015, Sarah Thomas became the NFL’s first full-time female official. In an Oct. 12 game between the Pittsburgh Steelers and the San Diego Chargers, Thomas made a correct last-minute goal line touchdown call in which the Steelers defeated the Chargers. But are a few females in typically male professional sports enough to call us an advanced and nonsexist society? Even if women in these roles make a few mistakes, are we willing to give them second chances like our society gives to men? As an aspiring female sports journalist, it is reassuring to see women break the mold and work their way onto the sidelines of typically male professional sports. Women need to be given their chance to show what they can offer until it is proven they have absolutely nothing to bring to the table. If a man was qualified for a professional coaching job, there’s no reason why he would not be given a chance to show what he’s got, so why not women too?